The Annual Arts Prom Country Art and Photography Show is being held this year from 31st Aug to 2nd September at Mesley Hall, cnr Ogilvy and Horn St, Leongatha. 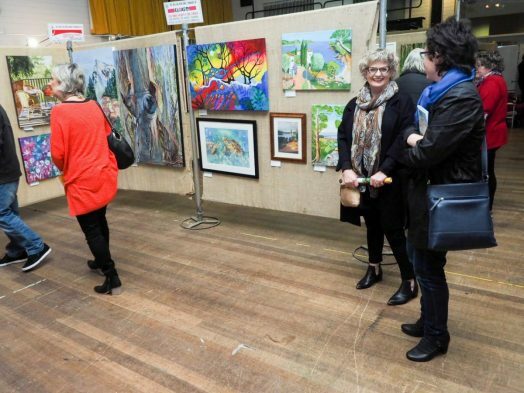 This highly successful show is in its 42nd year and is organized by the Rotary Club of Leongatha. The opening hours of the show are Friday 31st August, 1-5pm (official opening 8pm). Saturday 1st 10am – 6.30pm and Sun 2nd Sept, 10am – 3pm . Entry to the show is $5 per person. Mark your diary for Friday 31st August, the opening night for this year’s Art and Photography Show starting at 8.00pm. Cost is $20 and includes finger food and drinks while entered artists are free. Tickets for the opening can be purchased at the door. The Show is on the same weekend as the popular Leongatha Daffodil festival, now in its 62ndt year, so it will be a major weekend for the region. On the Saturday there will also be a street market, entertainment and car display. Don’t miss these excellent family events. The organizers are now accepting entries for this year’s show up until 10th August. Apart from the opportunity to display your work to an interested audience, the show has had a great record of buyers over its long history. The show attracts over 550 entries from artists and photographers from across Gippsland, Melbourne, regional Victoria and interstate. New and established artists of all ages are welcome to enter and prizes totaling over $6000 which include awards for various mediums, photography, 3D (e.g. sculpture), junior sections and All Abilities section. The awards are announced on opening night. Art Show Chairman Harry Leggett has also said there will be a major raffle prize – a magnificent oil painting and previous winner of the show. The raffle and other money made over the event go towards many worthy local charities and services.